Car rental serivice provider in Zhuhai city China ! We drive your way in Zhuhai! Zhuhai is located in the Pearl River Delta, on the southern coast of Guangdong province in China.It borders Jiangmen to the northwest, Zhongshan to the north, and Macau to the south. Zhuhai was one of the original Special Economic Zones established in the 1980s under the principle of Opening Up policy. It is also one of China's premier tourist destinations, being called the Chinese Riviera. Zhuhai has a humid subtropical climate affected by the East Asian Monsoon and moderated by the South China Sea, with long, hot and humid summers and frequent thunderstorms, and short, mild and dry winters. 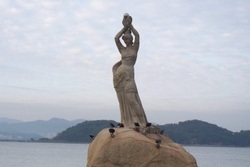 Zhuhai's attractive environment and surrounding landscapes built its reputation within China as a garden city and the city for having the best quality life. Realizing the substantial benefits from tourism, the local government is constantly improving the existing tourist spots and exploring new tourist resources. Some many tourist sites are : The New Yuan Ming,The four buddhist mountain Scenic are, Palace,hengqin, Dong’ao,hebao etc and each year it is continuously attracting more and more visitors from home and abroad. The outstanding geographic location, a wide range of supporting infrastructure and a deep-water port serve as a major attraction for foreign capital. Among the top 500 enterprises worldwide, 19 of them have investment projects in Zhuhai such as ExxonMobil, British Petroleum, Siemens, Carrefour and Matsushita.The manufacturing industry in Zhuhai covers electronics, computer software, biotechnology and pharmacy, machinery and equipment as well as petrochemical industries. Aiming to strengthen the existing industrial base as well as to provide a better environment for the development of new high-tech industries, the local government has taken the initiative in developing five more economic zones. The International Aviation & Aerospace Exhibition and the Zhuhai Film Festival are held every two years in Zhuhai. Shanghai Car Rental Service will be very honored to have the opportunity to serve you in Zhuhai with our great limousine services, we will insure a hassle-free, most comfortable trip no matter you are traveling Zhuhai for official business visits or personal tourists or come to attend the exhibitions in the city. All our drivers are from local and they are all licensed, well trained and with more than 10 years’ experience in serving our foreign customers, they are also quite familiar with the routes in Zhuhai and other cities in Guangdong Province ,can easily drive you wherever you want. ◆ Zhuhai railway /bus station/ transfer services . ◆ Zhuhai Daily Limousine or car rental services (chauffer services) for short term period, include Zhuhai sighseeing mini van , bus or Business tours or factory visits to neighborhood cities in GuangZhou,Shenzhen,Foshan, Jiangmen,Zhongshan and other cities in Guangdong province . City tour sedan /mini van/mini bus/coach services for individual or group travelers. ◆Long-term car lease for individuals or cooperates in Zhuhai. We are now accepting bookings for the car rental services with drivers / Chauffeurs for the coming China International Aviation Exhibition held in Zhuhai in 2018. Our vehicles are available as: MPVs, Luxury Limo, Coaches / big buses as well as local tour guides and Interpreters. With successful experience in the past years handling such big event and provide the local grand transportation we are happy to serve you here with our excellent services in Zhuhai China. China International Aviation & Aerospace Exhibition (namely Airshow China) is the only international aerospace trade show in China that is endorsed by the Chinese central government. It features the display of real-size products, trade talks, technological exchange and flying display. Since 1996, the show has been successfully held in Zhuhai in every even-number year for nine sessions. Airshow China 2018 will take place from Nov. 6-11th, 2018.